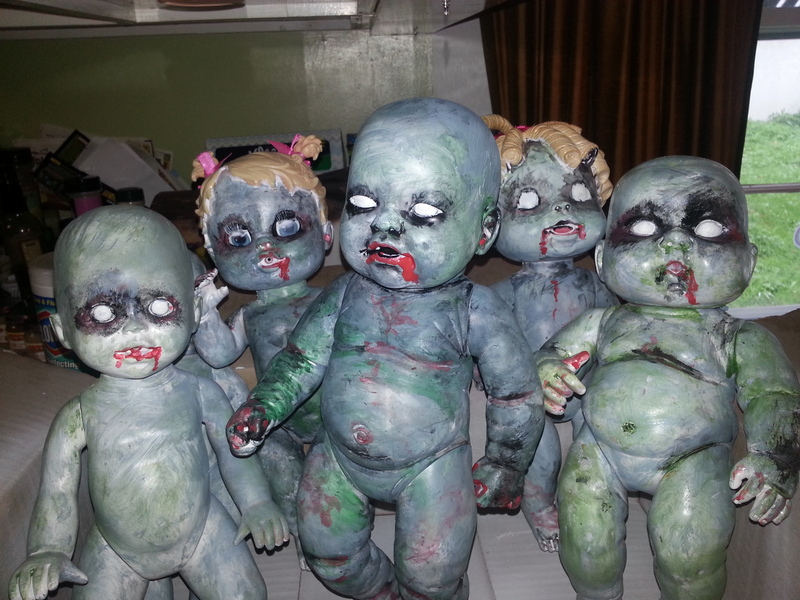 This entry was posted in Props and tagged Creepy, DIY, Dolls, Halloween, Props, Walking Dead, Zombie by thewritegirlforthejob. Bookmark the permalink. I totally get why you had nightmares. Strangely adorable though. Thanks! They are strangely disturbing and they have that effect every time I walk by my dining room(where they are until next week). I hope my neighbors are not too put off when I put them in my yard. These are terrifying. In a… morbidly good way. Totally understand where nightmares came from. Myrna, Sorry it took so long to reply. Went on a vacation(without computer) that ended in a severe respiratory infection that really knocked me down. I appreciate the good laugh you gave me. But I’ll let you in on a little secret… My creations have been the center of some very scary nightmares of my own. LOL Those dolls had creeped me out so badly after making them that I had to cover the box until they went outside. The Ring Girl has been the worst in the fright department for me. Even though she’s been put outside during Halloween season for over 8 years now – you’d think I’d get use to it. But no – LOL Ever so often I will walk by a window and see this creepy girl, back hunched over, with long black hair, and I jump for a second because I forget I put her there! LOL I hope letting you know this gives you as much as a laugh as your story too. Thanks for visiting my blog and enjoying my creations! I bought some stakes at Home Depot for my zombie dolls and have must of them standing up. I actually use stakes with all my outdoor props because it gives them stability and added security (Yes, my props have been stolen before). For the dolls and shorter props I’ve used: Marshmallow roasting sticks (sawed in half), Dollar Store gardening stakes, dowels from craft/hardware stores, and metal bars. So I hope this was a helpful hint if you want to keep your props upright AND safer. Thanks for the comments and stopping by the blog.